An SA that causes characters within X amount of squares to lose Flight. It should be fringe and cheap. Basically a souped up Accurate Shot. he would be vong or at least have affinty for vong and would have embrace of pain and I could see melée reach 2. 3p0 in battle droid body. This is all directly from my friend Andy, who doesn't post here. Gallandro- No stats, I just want a character to have either Gunslinger= +4 Att & +10Dam against acc shooters, or Quickdraw= Line of sight at init he can make one immediate attack, doesn't count as an activation. Plus he would qualify for the Solo hunter ability. At the end of this characters turn you may activate one other adjacent Imperial Character, this does not count as one of your activations this phase. Whenever a non-unique follower within 6 squares is defeated it may immediately make an attack at +4 attack. CE: At the end of this character's turn one ally may move up to it's speed and then attack. "she had to learn to rely on things other then the force"
CE characters in your squad with pilot count as having the same name for purposes of commander effects. Allied pilots gain squad firepower. Pilot Allies that activate to combine fire can immediately move two squares after the attack is made. Force Teleport (force 3, replaces turn; touch, move one adjacent character to any empty square, that character counts as activated this turn. This move does not provoke attacks of opportunity. (Blank) Appropriations X: Once per round, whenever you would add Reserves to your squad, you may add up to X points of non-unique characters of the listed type to your squad as well. A Reserves booster. Boosts the numbers brought in by any Reserves in your squad, but limited by having to have another Reserves character. Quick Reflexes: +6 Def against attacks of Opportunity and attacks made with Strafe Attack and Gallopping Attack. Yeah, Quick Reactions needed a flip. Surprised it never happened. Anyway, tossed in something else that seemed a bit appropriate right now. Crimelord: While there are only Fringe characters in your squad, Fringe allies gain +2 Atk and +2 Def. Powerful, yes. But I think encouraging Fringe only squads is a great idea, and something like this would be needed to not need to use the great CE's non-Fringe commanders have. +1, and you just answered 2 questions I had when looking at your custom set. Advantageous Opening: Special abilities that grant bonuses to attacks made against unactivated enemies may grant those bonuses to attacks of opportunity. My line of thought here is to give a nice boost to all the minis with cunning attack against Yobuck and beatsticks that run past and take aoo's that don't really hurt because you don't get cunning attack. 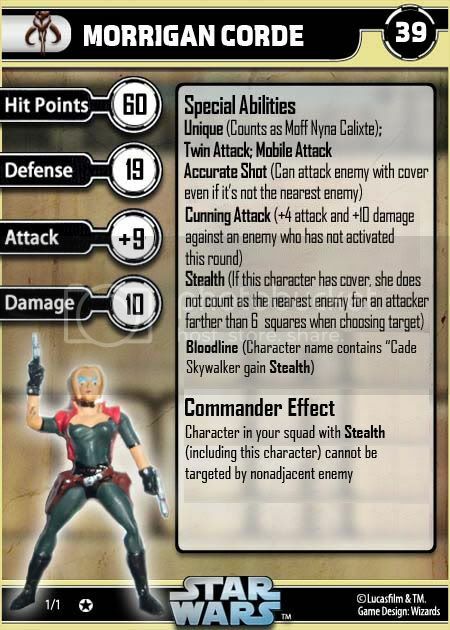 This ability would make minis like Jabba the Hutt, Crime Lord very usefull against Yobuck and other beatsticks, as well as the countless other cheap fringe peices with cunning attack that don't see as much play as those with opportunist attack. I was thinking that this ability could be granted as a CE and that it could also be put on new peices with Cunning Attack or Advantageous Attack. A commander that grants this in his CE, IMO, should only be a Fringe commander and grant this ability to only Fringe ally's. Last edited by obikenobi1 on Thu Aug 25, 2011 1:13 pm, edited 1 time in total. *Crush Gauntlets - Attacks made by this character against adjacent enemies count as Melee. These attacks or damage from these attacks cannot be prevented or redirected (basically works like Overwhelming Power). *Saber Dart (replaces attacks: make an attack against a living character ignoring cover for targetting purposes. A living character damaged by this attack takes 20 damage whenever it activates, save 11 to negate damage and stop this effect). Slowly digesting the competition, one game at a time...brrrrp! I would like to see another peice with the force power Force Burst. It has been so long since a peice had that on it, and it is really a very usefull power. I'd also like another peice with Sith lightning. Again, it has been a while since a peice had Sith Lightning and in some ways sith Lightning is really good, as you can lightning a peice adjacent to you not fry yourself. Maybe something like Sith Lightning 4 that repalces attacks, does auto 60 dmg and can activate save 16. I always imagined Sith Lightning as a more powerful, more directed form of Force Lightning. Ok, a few things I have wanted to see forever and always wondered why they weren't in the sets. 1) Prototype as an ability. They put out a bunch of prototype droid mini's but instead of make an ability for it they just nerfed a stat to represent it. I was thinking something like Prototype: Whenever this mini takes 40 damage or more from a single attack it is considered activated for the round. 2) We have at-at, at-st, even the at-rt, but no at-pt?!?!? I want an at-pt with DR20 and little else. A good wall basically. 3) A dooku with a force choke that can stun. For cripes sake, he is the only other person in the movies who uses the ability but he never got it? That, and a jedi verson of dooku for the republic (kinda like palp has) would be neat. 4) Give the mando's and the vong some more love. They are 20-25 mini's shy of any other faction. Mando recruit, mando melee expert, mando sergent, whatever. Vong, well, I don't know enough to make mention of them. 5) LITTLE Anikin skywalker!!!!!!!!!!!!!!!!!!!!!!!!!!!!!!!!!!!!!!!!!!! I have been pushing a lil annie for like 5 years now. Just a little kid with high repair and whatever else you see fit. Like pilot or something. Either way, he was the focus of an entire movie and yet him at that age has yet to be represented. But noooo, lil boba who was on screen for like 5 minutes and already had better fringe versions of himself won. 6) Grievous 2.0. His shell/armor thing was later found and designed as a lightsaber combat droid. I think it would be cool to make into a mini. 7) More naboo, utapaun, and bespin pieces for lando, teon mendon (sp? ), and typho to use. 8) Interrogation droid. Need one...imp droid, wants it. 9) a new version of the dwarf spider droid. That poor little rare is just sitting there, waiting for updated stats and abilities. There are a lot of mini's like him, but he needs it most!!! 10) Last thing for now. I want to see a commander effect that grants heal. Maybe a flavor version of Flamethrower 10 that doesn't harm the user. I'm pretty sure the Vong weren't flaming themselves when using those creatures as weapons. Or maybe a fire spitter could be a Vong version of Splash 10 that doesn't hurt the the person using it. I'm thinking something for the vong that grants melée reach 2. Either c.e. or special ability. But those amphistaphs had a little range to them and would like to see them represented somehow and IMO would help the vong out espicially since the vong are never going to have jedi reflexes they need help in a different way.